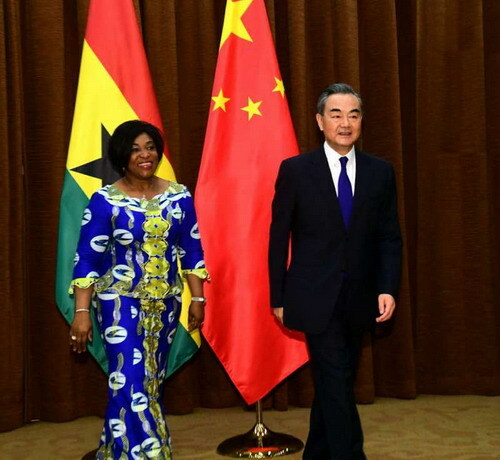 On June 11, 2018, State Councilor and Foreign Minister Wang Yi held talks in Beijing with visiting Minister for Foreign Affairs and Regional Integration Shirley Ayorkor Botchwey of Ghana. Wang Yi expressed that since the traditional friendship between China and Ghana was jointly established and cultivated by the elder generations of leaders of the two countries, both sides need to cherish it with double efforts to pass it on from generation to generation, and constantly inject new epochal connotation into it. 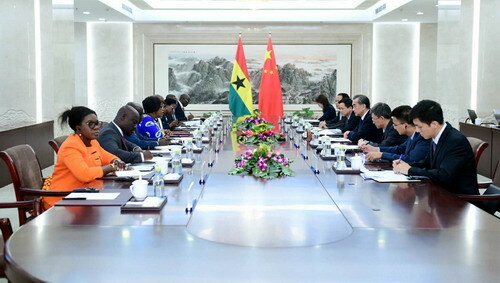 China regards Ghana as an important cooperation partner and is willing to, in accordance with the concept of policy towards Africa featuring sincerity, real results, affinity and good faith and the values of friendship, justice and shared interests put forward by President Xi Jinping, make concerted efforts with the Ghanaian side to promote bilateral relations for constant and forward-looking development. The two sides should maintain high-level exchanges. It is a pleasure that President Nana Addo Dankwa Akufo-Addo has confirmed his attendance at the Beijing Summit of the Forum on China-Africa Cooperation (FOCAC) in September in China. Both sides should strengthen strategic communication, deepen political mutual trust, strengthen exchanges of experience in state governance and administration, and continue to understand and support each other on issues concerning respective core interests and major concerns. Both sides should give full play to the advantages of the wide-ranging, deeply-rooted and fruitful practical cooperation between China and Ghana, and further broaden cooperation in various fields. China is willing to make good use of the platform of the FOCAC with Ghana to jointly build the Belt and Road. We will, in line with the principle of extensive consultation, joint contribution and shared benefits, keep tapping into the potential for cooperation to better benefit the two countries and the two peoples. Both sides should strengthen strategic coordination within the multilateral frameworks and work together to safeguard the fundamental interests of both countries and developing countries. Shirley Ayorkor Botchwey thanked China for providing Ghana and Africa with selfless assistance for a long time. Ghana-China relations have all along maintained a strong development momentum. Ghana is a good friend of China at any time and always stands with China. The new Ghanaian government attaches great importance to developing Ghana-China relations, firmly adheres to the one-China principle, and hopes to further deepen the level of bilateral relations on the basis of traditional friendship. President Nana Addo Dankwa Akufo-Addo is looking forward to attending the FOCAC Beijing Summit in China within this year. The Ghanaian side eagerly hopes to learn from China’s experience in reform and development, actively participate in the Belt and Road construction, and comprehensively strengthen practical cooperation in the fields of trade and investment, infrastructure construction, and people-to-people and cultural exchanges between the two countries, so as to push bilateral cooperation for constant and new progress as well as promote the in-depth development of the overall cooperation between Africa and sub-regional organizations and China.